Kenyan farmer Alica Waithira shares the responsibility for managing her farm with her family. Her brothers take on the lion’s share of growing food for the family and fodder for the livestock. Alica takes care of the livestock—six cows, five sheep and countless ‘free range’ chickens. Making sure her animals are healthy and productive is critical to her success (photo credit: Gates Foundation). Women livestock keepers are key to global food security. Those working to support women in livestock development have just received some support of their own. About 752 million of the world’s poor keep livestock to produce food, generate income, manage risks and build up assets. In rural livestock-based economies, women represent two-thirds (some 400 million people) of low-income livestock keepers. In the Gambia 52% of sheep owners and 67% of goat owners are women. In the mountains of Chiapas, Mexico, sheep husbandry is mainly women’s responsibility, providing 36% of household income through wool processing and sale. In Afghanistan, traditional backyard poultry activities are carried out entirely by women, who manage an average of 10 hens that produce some 60 eggs a year, sufficient for household consumption. And across the world’s regions and cultures, milking and milk processing are mainly undertaken by women. In spite of their heavy involvement in livestock farming, customary gender roles are often biased, hindering women’s access to resources and extension services and their participation in decision-making. One result is that women get less household income than their menfolk do from livestock farming. To help redress this, staff of the United Nations Food and Agriculture Organization (FAO) have worked with the International Livestock Research Institute (ILRI) other organizations to support gender analysis in livestock projects and programs worldwide. This group has just produced a booklet—Understanding and integrating gender issues into livestock projects and programmes—A checklist for practitioners—that identifies the main challenges faced by women in managing small stock, particularly poultry, sheep and goats, and in dairy farming. The booklet is an outcome of a consultative training workshop held in November 2011 in Addis Ababa, Ethiopia, involving four East African countries. The workshop participants shared and critically analysed country-specific experiences from a gender perspective. The booklet compiles this knowledge with the aim of helping livestock experts in the field to identify and address the main constraints faced by women and men both in managing small livestock and dairy farming. The booklet includes a set of tips and gender analysis tools and a checklist that, through all the stages of a project cycle, offers gender-sensitive guidance. 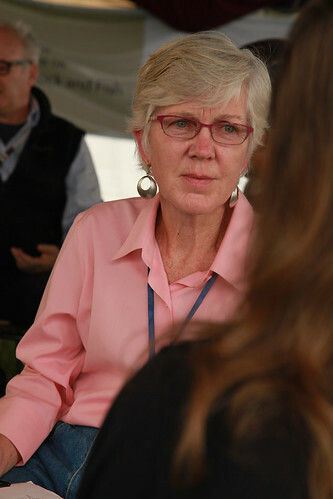 Kathleen Colverson, ILRI Program Leader for Livelihoods, Gender, Impact and Innovation. The Addis Ababa workshop was such a success that FAO is holding another regional training workshop this week (4–6 June 2013) in Bangkok attended by representatives from eight countries from Southeast Asia and Bangladesh; a second booklet, generated by the Bangkok workshop, is planned. Significant inputs to the Addis Ababa workshop and subsequent booklet were made by gender experts from the International Livestock Research Institute (ILRI), including Jemimah Njuki, who facilitated the workshop. Njuki has since left ILRI and is now based in Dar-Es-Salaam, where she leads a 6-country ‘Women in Agriculture (Pathways)’ program for CARE. Other inputs were provided by staff of the International Fund for Agricultural Development (IFAD), the Global Alliance for Livestock Veterinary Medicines (GALVmed) and representatives of ministries of livestock, agriculture and fisheries in Kenya, Uganda and Tanzania. Kathleen Colverson, who succeeded Jemimah Njuki as program leader at ILRI, is facilitating the livestock and gender workshop being held this week in Bangkok this week. Read the booklet: Understanding and integrating gender issues into livestock projects and programmes: A checklist for practitioners, FAO, 2013. This entry was posted in Books and Chapters, Capacity Strengthening, East Africa, Gender, ILRI, PA, PovertyGender, Presentation, South Asia, Southeast Asia, Spotlight, Women and tagged FAO, GALVmed, IFAD, Jemimah Njuki, Kathleen Colverson by Susan MacMillan. Bookmark the permalink. It’s very touching and needy article. Much research,planning and implementation is required in this field.It is not happening in poor families but in the richest ones in the most prosperous state of PUNJAB of INDIA.The rich landlord have the earning after every six month from their cops.These are the women only who make money by raring livestock to bear the expenses during these months……….. I have come across a widow in MALERKOTLA in PUNJAB,INDIA,having two sons,one drug addict and another mentally unsound.She was courageous and made livelihood by raring two buffaloes and performed her HAJJ. Thank you for sending contact name/details?